Lasers work by selectively destroying the hair follicle. elōs Technology uses combined energies to effectively and gently remove hair of many colors and types from all skin tones. 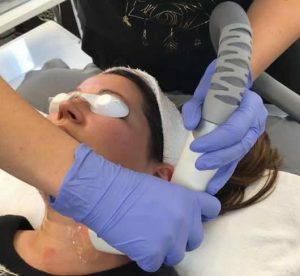 Adding Radio Frequency (RF) energy to Diode optical laser energy creates targeted heating of the hair follicles. Compared to other Diode lasers, less optical energy is required, making the elōs Plus a more comfortable and safer treatment for hair removal. Motif™ Hair Removal, powered by elōs technology, is safe and effective on the widest variety of skin and hair types. Patients receive a very comfortable treatment due to the high frequency and lower energy delivery of the elōs laser. For people with darker skin types (skin type 4-6) a pre-treatment or prepping of the skin may be required before any laser treatments can be preformed. A small spot on the area to be treated may be tested with the elōs Motif before any further treatments will be preformed. This helps to ensure your skins reaction to the laser treatments and settings. In certain cases, darker skin types may require a particular laser, for example, Yag Lasers will be recommended because it could provide a more effective treatment. Here at Omni Medspa we use the elòs® laser by Syneron and Candela for hair removal. In order to achieve successful Laser Hair Reduction, a series of treatments must be undergone at very precise time intervals. Hair grows in cycles and those growth cycles vary depending on the part of the body. For example, hair on your face or your underarm grows faster than hair on your legs. To achieve the best treatment results the laser hair removal sessions have to be spaced out according to the hair cycle growth. Areas on the face require treatments which will occur every 4-6 weeks. Underarms, bikini, or trunk area every 6-8 weeks, while the leg area is every 8-10 weeks. Patients must be treated during these specific time periods to ensure that the new hair follicle growth is being targeted. In order to achieve around a 60%-80% reduction 6-8 treatments are recommended. After your sessions are complete you will need touch up treatments to maintain your results. Discontinue plucking, waxing, use of hair removal products or bleach throughout your course of treatments. Do not any Retinol, Retin A, Tretinoin, etc for at least 3 days prior. Make sure the area to be treated is clean shaven. After your treatment you may experience some redness, swelling, or irritation. Generally, this lasts for only a day. You may notice that the hair growth is finer or less after a few treatments, results will continue to progress with the number of treatments completed. A rare but potential risk is a burn, which can alter skin pigment and rarely scar formation can occur. It is important that patients understand hair growth is affected by many different factors including: hormones, genetics, age, medication, and skin color. Everyone responds differently to hair removal based on all of these factors. Most patients can expect an average of 60% – 80% reduction at the end of their treatments. You will need touch up treatments in the years to come for any hair re-growth and for maintenance of your treatments.